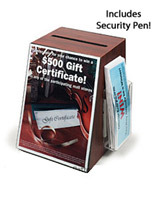 Are you shopping for a wooden collection box for an office or upscale lobby? This quality unit is the ideal solution. 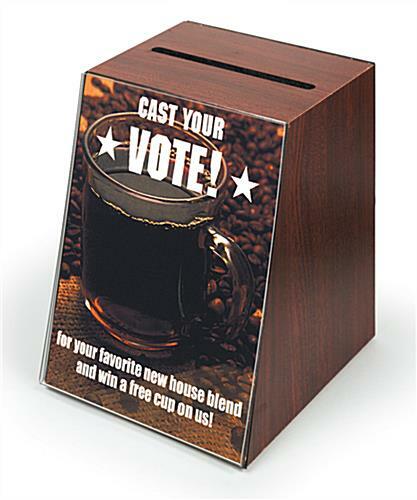 This wood ballot box is constructed with quality wood materials with a rich mahogany finish. 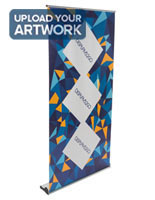 Each wooden container for leads features a slanted front that is typically used to post a sign or graphics. 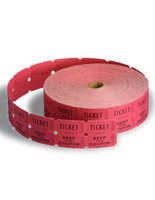 Each wood ballot box has a generous slot that allows for most any size entry form when folded. The back of the unit features a removable door to access the contents. 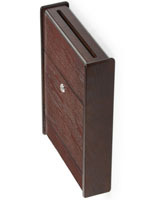 The wood ballot box, also called a lead box, has two clasps mounted to the back of the unit to keep the door mounted. Simply rotate the clasps outward to remove the back panel and access the interior of the container. This wood ballot box that has a large internal area can hold hundreds of ballots, or suggestion forms. 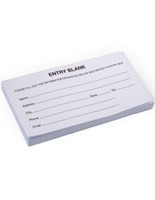 Use the angled front of the wooden unit to promote the purpose for collecting information, entries or opinions. The presence of a writing utensil encourages more participation. 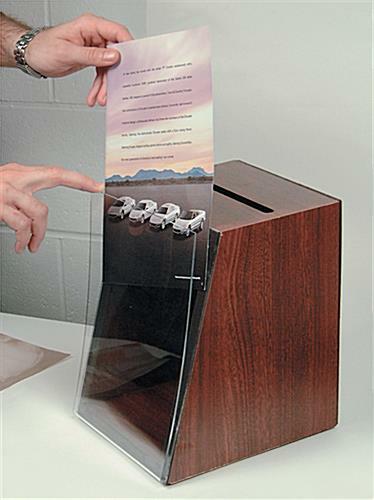 This wood ballot box is also offered with an optional brochure holder, (see related products). 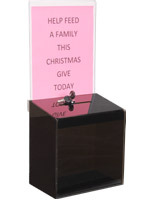 Place this wooden suggestion box in an employee lounge or break room to collect information regarding the improvement of company policies or morale. 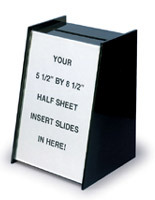 This wood ballot box is an effective means of gathering information in a corporate or public setting. Received the order in the mail promptly and was pleased with the look and functionality. Instantly was able to use the box for all of our needs and has served us well! 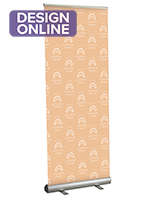 I'm sure this product will continue to aid us all our activities as we desire in the future.